Dr. Duch on trifocal intraocular lenses: the multifocal lens trends. 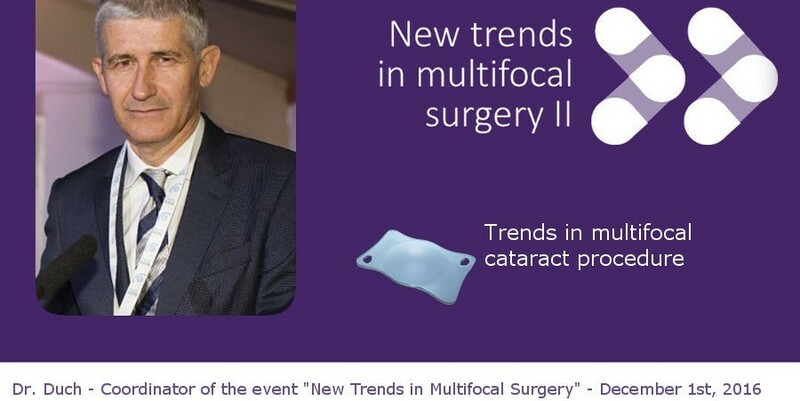 During the second edition of “New Trends in Multifocal Surgery”, a platform for discussion regarding new trends in cataract surgery procedure and multifocal lenses that was held at the beginning of the month, Dr. Francesc Duch, Head of Refractive Surgery Department at Institut Català de Retina and coordinator of the event, highlighted the prominent place that trifocal intraocular lenses currently have, being the more advanced option in multifocal intraocular lenses. Dr. Duch discussed with the rest of panel experts the new trends in cataract surgery procedure and emphasized the improvement made by multifocal lenses in terms of patient rehabilitation, as until now they had improved near and distant vision and gained some independence from glasses or other corrective methods. But he stressed that the real progress has been trifocal lenses, that provide a third focal point for intermediate vision, thus advancing towards a more natural vision, which is useful for a great range of tasks, among which we find the use of mobile phones or computer work. Besides, trifocal lenses provide in most cases a complete independence from glasses or contact lenses at all distances. In turn, trifocal lenses known as toric lenses, allow independence from glasses in patients that, in addition to hyperopia, myopia and presbyopia, also have astigmatism which, to date, was difficult to correct. Trifocal lenses and toric lenses contribute to a better quality of vision and of life in these patients by means of an intraocular lens implantation performed during a surgical intervention that lasts approximately 10 minutes. The implantation of these trifocal intraocular lenses, a technique used by ICR to correct refraction errors, is an option whose results have been qualified as “really good” by specialists. The meeting on multifocal surgery attracted interest from media, such as Siete Días Médicos and PR Noticias.